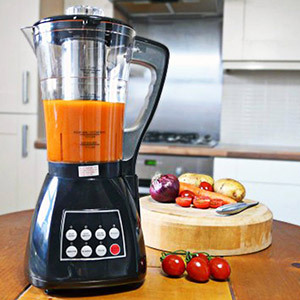 Electric soup maker makes seriously scrumptious soups which pack a hard nutritional punch! With winter wrapping its cold arms around us it can be hard to get much fulfillment from anything during this blustery time of year. As we become increasingly chilly everything becomes more of a challenge, the nights are long and dark, commuting anywhere is total headache, peeling yourself away from your duvet is the most painful thing in the world and quite frankly the term ‘winter wonderland’ is some fantasy idea that’s portrayed on the front of advent calendars. There is one thing that may make you feel a little bit better about your winter blues and that’s a hot bowl of nutritious homemade soup! In winter it’s oh so easy to forget healthy eating and get caught up in convenience foods because the days are traumatic enough! With a soup maker you can easily prepare a quick and easy cold remedy or meal for you and your family to enjoy and look forward to. Nutritionally dense and seriously scrumptious you know exactly what’s going in your soup – so that’s probably a vast array of all your favourite ingredients and juicy roasted vegetables!!! What’s more you can make your soup the day before and then simply warm it up when you arrive home. Want to take the first step at combatting your winter blues? Maybe you are new to soup making? Fear not because we have the perfect winter recipe that all the family will love! It’s easy to make and tastes delicious! Chicken soup – Homemade chicken soup is renowned for being a super cold remedy plus the steam helps break up nasal congestion – just let your left over chicken gently simmer with some added garlic and salt onions. Serve up after a few hours. Immune system boost - Throw in an abundance of Vitamin C rich vegetables or fruits such as orange, pineapple, kiwifruit, cantaloupe, cranberries and raspberries for a soup or fruit smoothie which will strengthen your immune system in the winter months – easy! For an added energy boost to your smoothie add a serving of Rio Amazon GoGo Guarana Powder. Hot orange & lemon broth – perfect for relieving the symptoms of a cold chop up some whole oranges and lemons and simmer gently – serve hot for an instant pick me up from your cold or flu. Ginger & Orange Peel drink – Mash up your ginger and allow the ginger to gently simmer for 20 minutes. Add a handful of orange peel and wait ten minutes. Strain and serve and it will help relieve those nasty cold symptoms. Roast carrot & fennel soup – A winter warmer & perfect for Christmas! Preheat your oven to around 190C, grab a baking tray/roasting dish and add in the carrots, fennel and onions along with the olive oil. Roast for approximately 20 minutes and the garlic cloves – return to roast for another 20+ minutes until the vegetables are soft and golden. Add your vegetable stock to your soup maker and add in the whole vegetables. Use the boil feature and allow the mixture to gently simmer for about 15 minutes. By keeping the vegetables whole so far you are sealing in all those beautiful flavours and goodness! BLEND! Blend the mixture on the smooth setting until the mixture is completely liquidised and a gorgeous orange colour. Allow your soup to stand for an hour or so to really enhance those flavours! Serve with a swirl of cream and a scattering of fennel. Serve also with a helping of shop bought tiger bread for the ultimate winter warmer meal! How easy was that? It’s also the perfect Christmas starter if you fancy something different or enjoy vegetarian choices. The soup maker opens up so many doors when it comes to lunch times as well as being able to make cold remedies for the whole family. From detoxing smoothies, to immune boosting broths there’s not much the soup maker cant do!